Saving a daily template can be useful if you have certain days where you would like to bring in a special set of shifts. (Ex. if you want to add an event to a day that requires a set of shifts that needs to be worked for that event). Note that when saving and importing templates, you can first filter your view to only include a specific Position, Category, or Group so that the template will only include those shifts. 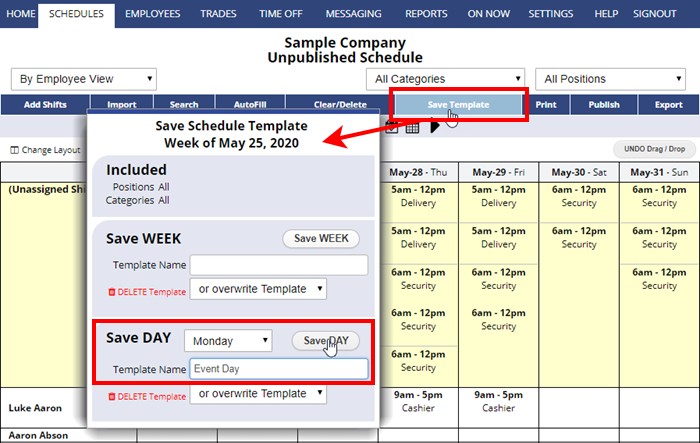 (Ex: filter the schedule to only include shifts for one position and then “Save as Template” to create a template that includes only the displayed shifts for that position in the template, if appropriate). 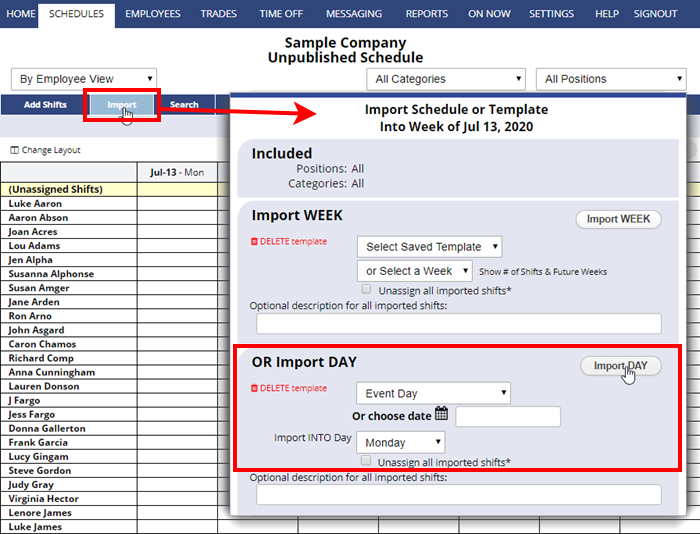 You can Import a previous day by choosing that date in the Import window, but if you want to create and name certain schedule “templates” (Ex. if you want to create a holiday schedule day and save/name it as a template for later importing) you can do so at any time. You can save any schedule that you have on the screen, or you can navigate to an empty week (future or past) and create a schedule to save as a template. When you are finished creating the template, click Save Template and name it. If you used an empty day to create the template, be sure to use the Clear/Delete function to remove the shifts from that day and set that day back to empty after saving as a template. In the “Import a Template” dropdown, you will now see your new template in the Import a Day section.